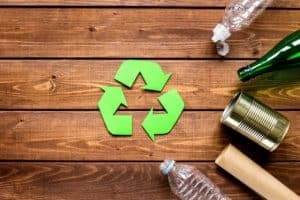 For most of us in Rancho Cucamonga, recycling means sorting a small amount of our refuse into little bins and putting them out at the curb on certain days. 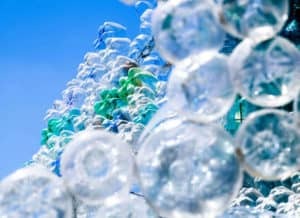 As for the items that are too large or not the right materials for local recycling program? They usually just end up in the trash. But if those items are scrap metal or CRV, you shouldn’t throw them out; you should bring them to Ecology. At our Fontana recycling center, located a short distance from Rancho Cucamonga, we can process any amount of scrap metal or CRV recycling. If you have small amounts, you can drive them over and we will process them quickly, paying you for your items. If you have a large load, you can arrange for special bins and pickup service. With us, the entire process is simplified so recycling is never a burden for you. So, if you have scrap metal or CRV you need taken off your hands, team up with Ecology. Everyone can answer this question: it helps the environment. But the question many of us cannot answer is: how? To help you understand why recycling should be a priority, let’s look at some of the benefits recycling offers. First, anything you throw away that isn’t biodegradable pollutes. They go in the trash and are hauled off to the landfill where they sit, unable to breakdown naturally within our lifetime. Some of these items just take up space, but others release chemicals that damage the health of the environment. 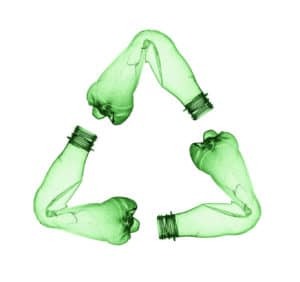 Recycling allows us to avoid starting the manufacturing process from scratch. It may not sound like much, but we save a lot of time, natural resources, and energy when we skip the initial steps in manufacturing. Finally, if you choose to recycle with Ecology, you get a direct benefit: money in your pocket. We compensate you for all scrap metal and CRV recycling you bring to our recycling center near Rancho Cucamonga, Ca, rewarding you for your efforts. When we hear the term scrap metal, we think of factories and construction and demolition—situations where you can expect large scale waste to be produced. 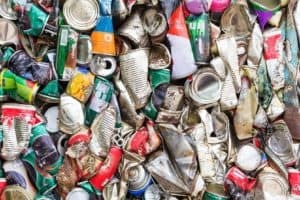 But you might be surprised to learn that you have scrap metal recyclable items sitting around your home. Some scrap metal items you might be ready to get rid of include old appliances, car parts, wiring, hardware, and bikes. No matter how much or how little scrap metal you have, we are here to take it off your hands. You can bring your small loads to our recycling facility or schedule bins and pickup for larger loads. Once we process it, you will be paid for your items. How much can you expect to be paid? This comes down to two factors: what type of scrap metal do you have and how much of it is there? We classify scrap metal into two categories: ferrous and non-ferrous metals. Ferrous metals contain iron and steel, but if you are not a metals expert, it can be hard to tell what metal something is made from just by looking at it. However, there is an easy way to determine if they are ferrous or not: grab a magnet. Ferrous metals are magnetic, while non-ferrous metals are not. You often find ferrous metals in construction, vehicles, and appliances. However, you do not have to check what type of scrap metal you have before bringing it in. We use a powerful magnet to separate ferrous and non-ferrous metals so you have no extra work to do. At our recycling center, we do the work for you. In terms of compensation, ferrous metals are not as valuable as non-ferrous metals. However, our compensation rates will make it worth your while to bring them in for recycling. Not to mention that once you get rid of these items, you will have more space in your home. Non-ferrous metals can be any one metal or mixture of metals as long as they do not contain iron or steel. As such, they include bronze, aluminum, copper, and stainless steel, as well as many other metals. Non-ferrous metals are used in window frames, plumbing systems, bicycles, and car parts. We offer the best rates when purchasing your non-ferrous metal at our recycling center. Californians take great pride in the natural beauty of our state, and as a whole, we work hard to preserve it. It is no wonder that we have many different recycling initiatives to encourage private citizens and businesses to recycle more. One program everyone should know about is the CRV program. With this program, you are paid for recycling specific items. Which items will you be paid for? 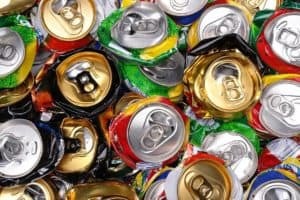 The first are cans—specifically soda, beer, and juice cans. The second are glass beverage containers, such as those used for soda, beer, and wine. If you have ever been curious about why people collect cans, it’s because compensation rates for them are high. Ecology is proud to be part of the CRV recycling program by processing your items and paying you for them at our recycling center. For lots under 50 items, we pay per item, and if you have over 50 items, we pay by weight. The driving purpose behind Ecology is preserving the environment. 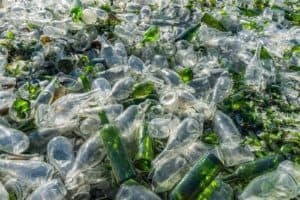 During our years in business, we have found that there are certain barriers that prevent people from recycling as much as they would like, and the number one barrier is a lack of convenience. To help, we have made our process as easy for you as possible. One way that we make it easy for you is by making sure we are always nearby. We have multiple recycling centers in Southern California with our recycling center being the one most accessible to Rancho Cucamonga residents. You can bring just your recyclables or pull the entire neighborhood together so you can bring in larger loads. And if you have industrial needs or have a project coming up that will produce a lot of scrap metal, we have a special service that will make recycling even easier. With this service, we deliver roll-off bins in the size you require and then collect them and replace them as needed. This can be a one-time service or you can schedule it as often as you need. If you are unsure if an item can be accepted or not, just call us and ask. We are always happy to answer your questions. Ecology wants Rancho Cucamonga to be clean, healthy, and pleasant for residents to call home. Recycling with us allows you to make your community better while also earning money and clearing space in your home or business. To learn more about any of our recycling services or our current compensation rates, give us a call. We look forward to helping you recycle.